It was one of those rare days when I was just coming home at that time of the day. This van came along, tooting its horn. It did a swerve as it came into view and parked in front of my neighbour’s house. Almost before as the van came to a complete halt, the driver was out of the door. He strode to the back of his van and flung up the door. Then he stood waiting. The neighbour came. My children went. It was treats time. Not a common sight these days. 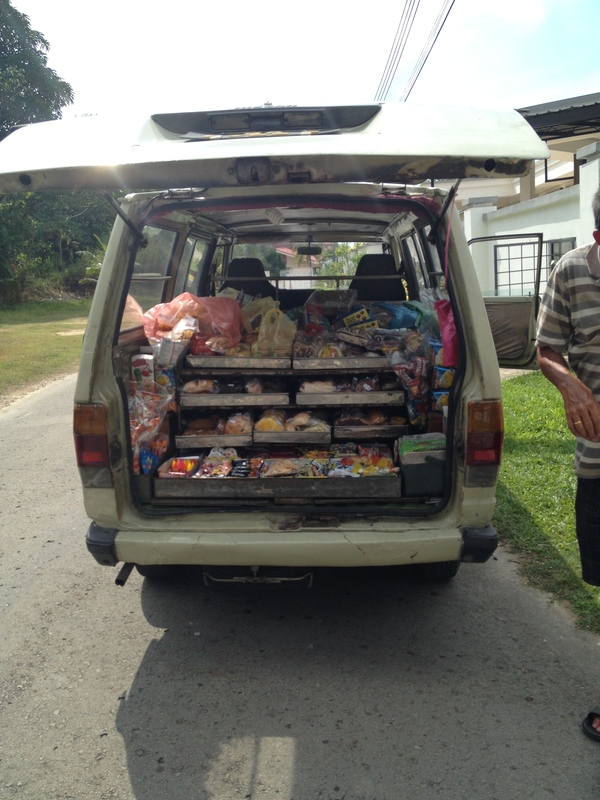 A van that bears bread, snacks and tidbits. This brought back memories. It would be a treat for us. My grandfather had a little tin pot of loose change just for such moments. It always felt special to be given permission to go to his table, pull open the top drawer and carefully select the allocated amount per child. It would be a proud moment to make sure that the correct amount was given to Grandpa and he would then allow us to choose. We learned simple mathematics. We learned to bargain with each other. We learned what was of value and what would be longer lasting. Those were the days. Long gone indeed…. I bought a little something just to encourage the old man that we would still welcome his services…. I hope he will continue for a long time more. This entry was posted on 05/05/2014 at 21:23 and is filed under Reminiscing. You can follow any responses to this entry through the RSS 2.0 feed. You can leave a response, or trackback from your own site.